Where are you interning? In Overseas Citizens Services (OCS), which is part of the U.S. State Department’s Bureau of Consular Affairs. OCS is responsible for the welfare and whereabouts of U.S. citizens traveling and residing abroad. How did you get your internship? I got my internship through FIU’s Diplomat in Residence Catherine Rodriguez. She was a guest speaker in my diplomacy class, and she brought in her boss who offered us an opportunity to intern at the Bureau of Consular Affairs. How does your internship connect to your current coursework? It doesn’t and that’s the beauty of it! My major is biology, and I am also working on a teaching certificate. You would expect people majoring in international relations or political science to be the only ones interning at the Department of State, but it is not like that. They have a spot for everyone here! And because it is something so different compared to what I’m used to, I get to learn so many things every single day. It has been really rewarding. What was the coolest thing that has happened thus far in your internship? I volunteered at a conference involving about 100 dignitaries from different countries. I had the opportunity to interact with them and to attend the conference. I also visited the Saudi Arabian embassy, where the ambassador talked to us and answered some of our questions. At the embassy, they also planned a small fashion show, where they explained to us the different outfits they used based on the occasion and the meaning of the colors they wear. What do you enjoy most about your experience? 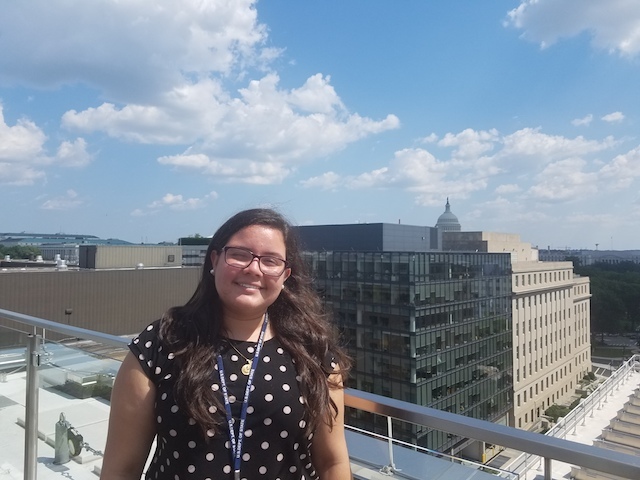 As interns we get to participate in many things such as conferences, career development workshops and tours around embassies, museums, and federal buildings. I have had also the opportunity to meet great, genuine people who are willing to help you succeed in life. What have you learned about yourself? I learned that I like international relations, and that I would love to work in diplomacy because it would give me the chance to help others. How has the position increased your professional confidence? I’ve had to step out of my comfort zone and reach out to others, introduce myself and set up meetings – something I never thought I would have to do or that I was afraid to do. How have you expanded your professional network? By emailing my co-workers and asking them to share more about themselves and the things they do in the work field. Also, asking for the contact information of people working in areas I am interested. What advice do you have for those beginning the internship process? Take advantage of every opportunity given to you. Learn as much as you can. You can develop tasks and skills that you will need in the future, and you just do not realize it yet. Ask questions and arrange informational interviews. People like sharing their work experience and how they got there. You can learn a lot from them. Knowing what others do can help you determine the things you like or dislike. Ask to be involved, and if you can attend meetings or participate in events. Most likely they will say yes. Worst-case scenario the answer would be no, but at least you tried; so there is nothing to lose.